Details of Mumbai Monorail are following. Mumbai Monorail started normal services. Monorail services running between Wadala and Chembur. The total distance between both the stations is 8.8 KM. The service started at 7 AM from both stations. Initially, the monorail will be operational from 7 AM to 3 PM at a frequency of 15 minutes. The operation hours and frequency will be increased after studying commuters response. Traveling speed for the Mono rail is 31 K mph. CHEMBUR , VNP MARG JUNCTION , FERTILISER TOWNSHIP, BHARAT PETROLEUM, MYSORE COLONY, BAKTI PARK and WADALA. Each rake carry 564 commuters. The seven stations on the 8.93 ­km long Phase I of the Monorail corridor are – Chembur, V.N.Purav / RC Marg Junction, Fertilizer Township, Bharat Petroleum, Mysore Colony, Bhakti Park and Wadala Depot. Minimum fare for this travel is Rs. 5 and Max is Rs. 15 only. Engineering major Larsen and Toubro and Malaysia’s Scomi Group are expected to commission the first phase of Mumbai Monorail, India’s first such system. The Rs 2,460-crore (Rs 24.60 billion) project, an initiative of the Mumbai Metropolitan Regional Development Authority, is a modern urban transport where cars move on a single beam in an elevated corridor. The project involves design, construction, installation, testing and commissioning from Wadala and Chembur (in suburban Mumbai) via Mahul (approximately 9 km) in Phase I and Gadge Maharaj Chowk to Wadala (approximately 11 kilometres) in Phase II. India’s First Mono-Rail service will start soon on the Mumbai. This will be the second longest mono rail services around the world too. The test drive for the same was already happened between Vadala Depot to Bhakti Park station. 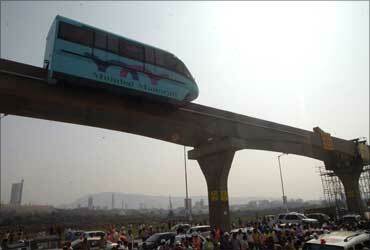 The monorail service is developing by MMRDA. Also the officials said that driver less services will available soon on the near future. One of the major advantage of the monorail is it will take less space only. This service is suitable on the congested areas of the cities. Hope this will clear majority of traffic jams. The monorail has a carry capacity of 30000 people per hour per direction and a maximum speed of 80 to 90 km per hour. 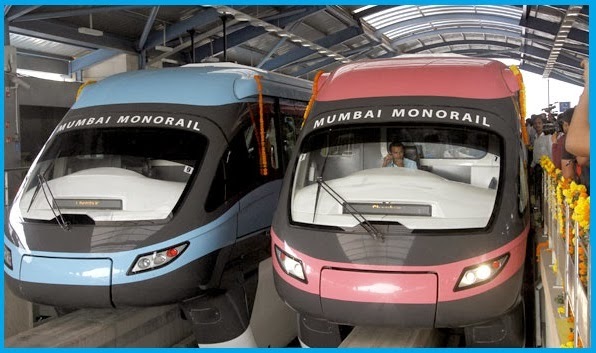 Mumbai monorail selected 3 varients of the monorail services says Green, Blue and Maroon.